Over a year ago I bought a silicone pan to make wee heart-shaped cakes, intending to make wee treats of love for Valentines Day. But I left the cake pan in Edinburgh, while I was enjoying Valentines in the country. So that didn’t work. 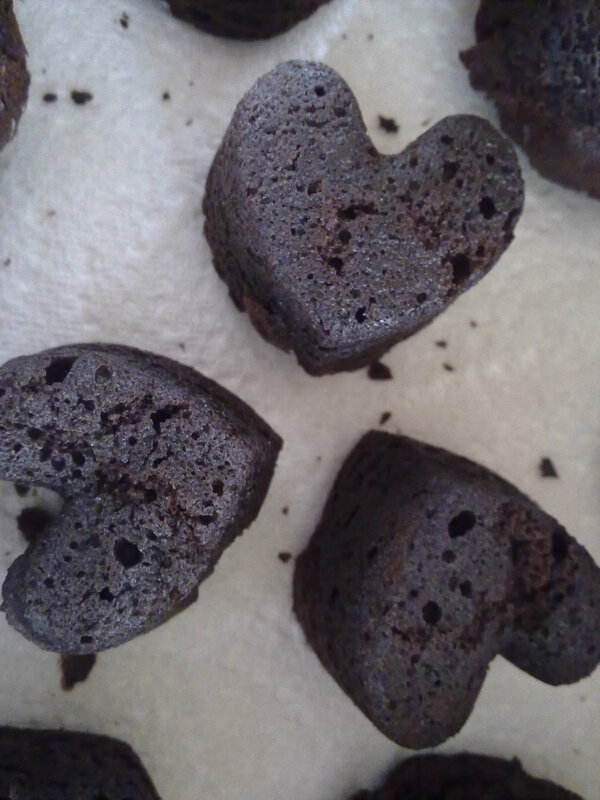 This year I remembered to bring the cake pan to the country, but had over-indulged so much already over the weekend that there was no way I was going to make any chocolate cakes, however cute and heart shaped they might be. I had a whole list of things to achieve: long walk with the dogs; drink with his kids in Glasgow; a couple of sewing projects to finish; soup to make; a curry to make (and eat); a greenhouse to clean and set up for the spring seed-sowing; laundry to wash and hang out; candle lit baths to loll about in. And I intended to do some veg bed digging too, but that didn’t get done. All the other things did get completed though (ish). 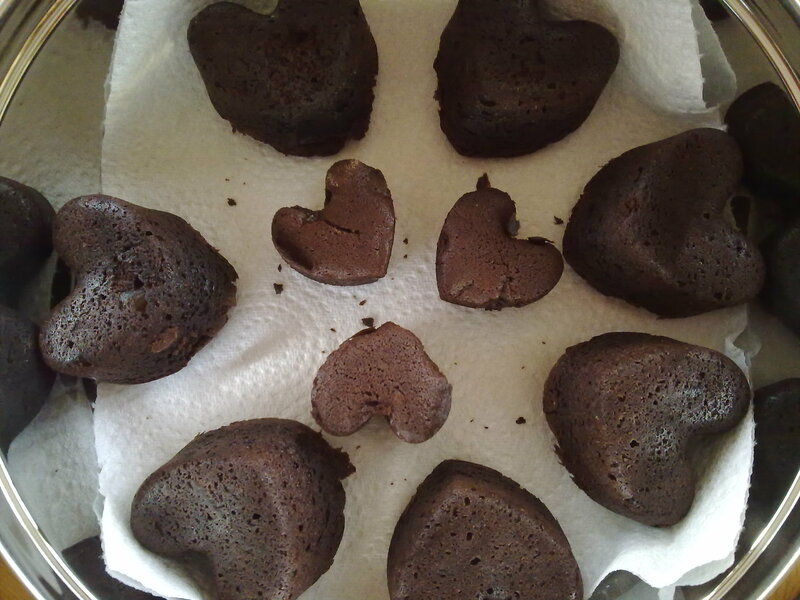 And while I was on a roll, achieving so much, I ended up achieving more too – I made the cutest heart shaped gingery dark chocolate cakes. And it so happens they are perfect with fresh pears, not even poached, just chopped up and put in a bowl with all their juicy loveliness, accompanied by a sweet wee chocolate heart of cakey wonderfulness. Pre-heat oven to GM 5 or 6, if you don’t have a silicone cake pan, prepare either a 23cm sandwich tin, or a loaf tin, or put a load of paper cupcake cases in a muffin tin. Delicious warm (heat up for 30s in the microwave) with that blackcurrant icecream I first made a few months ago. Or as I said, just with fresh pears. Or on their own, just as a wee treat with a cup of coffee. I suspect that they would be mighty scrumptious with a cream cheese icing too. Or replace the ginger nibs with some frozen raspberries, scrunched, or chopped up, and serve with a raspberry coulis. If you have a notion to make a tart mid-week, and you don’t get home till about 7pm then you really need to use bought pastry. And if your rolling pin is in the country and you are in the city, then you need to use pre-rolled bought pastry. So, I swallowed my pride and bought pre-rolled shortcrust pastry tonight. I think it may be a first. And now that my pride is well and truly swallowed, I can admit that it probably won’t be the last! 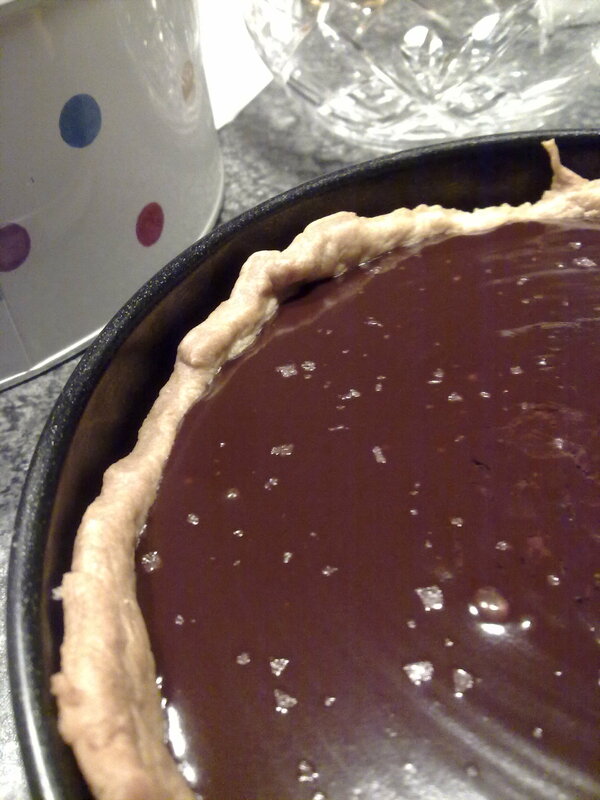 My notion was to make a rich chocolate tart. I’d been thinking of rich chocolate tart since before breakfast (I know, I know, this isn’t healthy behaviour) and then I went out to lunch with the lovely PAtothecity and she told me all about her fabulous Hotel Chocolat experience yesterday evening, including chilli hot chocolate. She asked how to make chilli hot choc, and I have a sneaky feeling I read a recipe for it just the other day, but have NO IDEA where, probably somewhere on this world wide web. Anyway, I suggested she split a chilli in half longways, de-seeded it and then popped the chilli in a pan with the milk. Warm it up and steep the chilli milk for a few minutes (depending on desired heat). Then remove the chillis, and add the chocolate, and warm to the right temperature for your hot choc. With this in mind, I decided my chocolate tart would be a chilli chocolate tart. A RICH chilli chocolate tart. A rich chilli chocolate tart with sea salt flakes. Preheat oven to 180C or Gas Mark 4. Grease a 23cm/9″ tart tin. Line the prepared tin with your rolled out pastry. Cover the pastry with a large piece of baking paper and fill the paper with dry chick peas, or baking beans* or rice, or whatever you can find in a packet or jar to weigh down the pastry. Put aside for a wee minute or ten (depending on how cold your kitchen is – mine is freezing, so I just left it for a couple of minutes and it had cooled down quite a bit) and then add a glug or two of milk (about what you’d add to a mug of coffee. If you have a hot kitchen, or if you like really cold things, cool it further down in the fridge. But personally, I’d serve it at room temperature, with a scoop of creme fraiche. Now, all I have to do is work out how to get it to the office tomorrow morning. And, given that St Valentine’s Day is next week, this might be an appropriate recipe for wooing your loved one. It would certainly work for me, but then I’m particularly susceptible to that chocolatey, salty, hot chilli combo of flavours. And not too sweet. All I need to know now is what wine to serve with it, as I suspect that it won’t work with fizz. Better ask Convivium Wine. I’m pretty sure the recipe came from my Aunt Joyce, the Queen of Baking in my world. And I’m also fairly certain that the recipe is in my mother’s recipe book. So, if I really wanted I could no doubt get back the original, and make them exactly as they were in those eternally sunny summers back in the mid 70s. But I also recall that they had half lard, half butter (or even marg) … and I know that using half lard can make pastry beautifully short, but I don’t think I want to use lard in my biscuits any more. So, if I’m going to play about with the recipe anyway, I may as well just find a new one, and adapt from there. So, this weekend I did some internet research, so you don’t have to. Although if you really want to find out more, you can do worse than starting out here on my friend wikipedia. Preheat oven to 170C or Gas Mark 3. Grease at least two baking sheets. Or I guess you could line them with baking parchment instead. 125g mixed nuts, chopped into wee chips. I’ve not tried it, but you could probably use salted nuts if you’re a fan of the sugar-salt-choc thing. Melt the butter in a big bowl (this is the bowl that the whole mixture is going to end up in so make it big enough). I use a microwave to melt the butter, but of course you could melt it in a pan and then tip it into the bowl. Now, how big do you want your cookies? I use about a soup-spoonful of mixture in a big lump, and they spread out to around 3-4 inches diameter. But you might want to make ENORMOUS cookies like those ones you get at train stations… you’d probably need about 4 TBsps of cookie mixture for that size. Remember to leave gaps between each dollop of mixture – the larger the dollop the bigger the gap required. For the enormous ones you’ll need at least 3″ I’d say. Bake for about 16 minutes, but this will depend on which shelf they are on in your oven, how hot the oven actually is and what size you’ve made your cookies. Ideally you need to take them out when they are golden around the edges, but not toasted in the middle. Leave them on the baking tray to cool down, they will continue to cook. Then remove them to a cooling tray. This will give you a slightly chewy cookie, if you prefer them crisper, just keep them in the oven a wee bit longer, till they are uniformly coloured. Once they are cool, transfer them into two separate airtight containers. Keep one lot at home, and take the rest to your colleagues, or to someone you love (not mutually exclusive). There! How easy was that? And according to my colleagues, they’re a winner. But before you run off to bake cookies, a top tip for you. Some of you will know this already, but if you’re not a baker you might not. 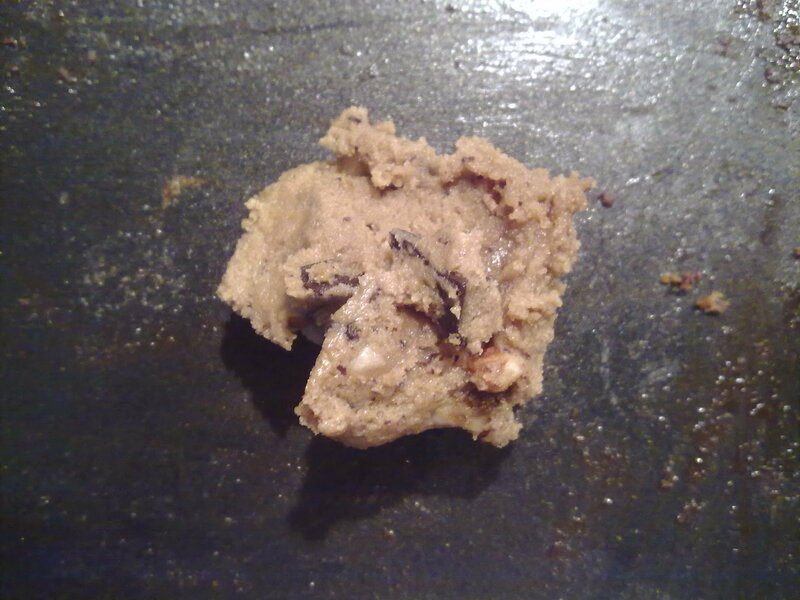 Don’t keep opening the oven door to check your cookies, and when you do open the door, be sure to shut it gently afterwards, as slamming it shut will blow in cold air, and mess with the cooking. This is even more important when you’re baking cakes, or anything you expect to rise. If you slam the door, it’s like slamming a big weight onto your delicate cake. So, most weeks I’ll buy some bananas at the supermarket, as I know he’ll take a banana to work each day, and it’s a way of getting towards that 5-a-day of fruit and veg. I hadn’t really thought through the whole Christmas/New Year thing and how it might interrupt his banana consumption. So, this morning I decided to do something with the three blackening bananas left on the side in the kitchen. Banana loaf was the obvious choice. Or I have a good foolproof and adaptable banana muffin recipe. But if I’m going to make muffins in the next 24 hours, it’s going to be vodka-soaked-cranberry muffins, using the cranberries from my vanilla cranberry vodka which are currently in the freezer waiting to be enjoyed. So, I turned to the internet for inspiration and good old Nigel Slater came up trumps again. 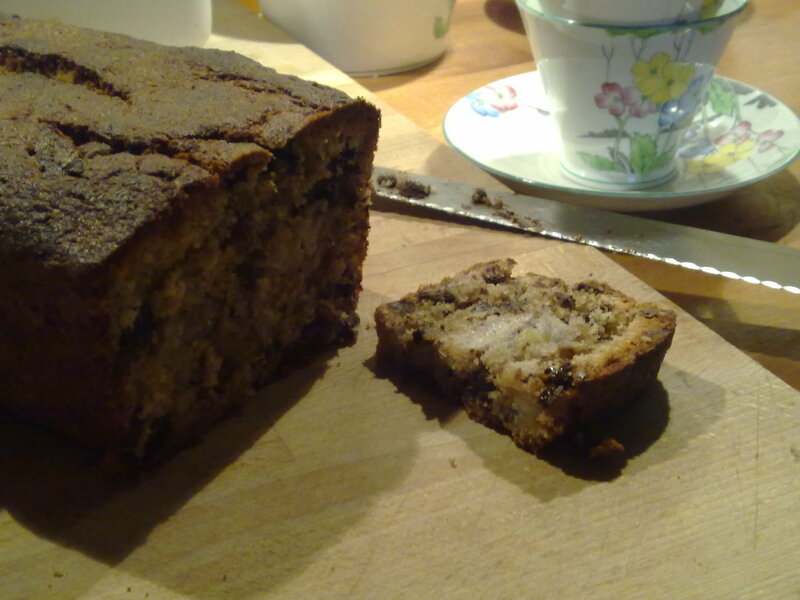 He calls it black banana cake. And I’m not sure if that is a reference to the state the bananas are in before you start, or the fact there is plenty chocolate in there, so the cake will be darker than you might expect for a banana cake. I figure it’s probably the former. As ever, I vaguely modified the recipe as I went along, but you can find his original here. Toast the nuts. Rub them in a tea towel to remove their skins if you can be bothered (I didn’t) and then grind them in a food processor, or with a zizzer or whatever implement you have to grind nuts. You’re looking for a pretty fine consistency – a bit like sand. I used a hand held zizzer, you know the kind of thing you’d usually use to blend soups. Add the eggs one by one and beat into the butter and sugar mixture. Mix in the nuts and SR flour. Peel the bananas and chop them into small pieces into the bowl with the sugar/butter/egg mixture. Gently fold in the vanilla, bananas and chocolate nuggets into the cake mixture. Don’t overmix. Shlop into the prepared loaf tin. Dust with a little Demerara sugar (I forgot to do this, and doubt it will matter too much). Bake for 1hr – 1hr 10 mins, covering the top with foil if the top looks like it’s about to burn. Oh my world, it’s amazing! Lovely light texture, strong zing of chocolate when you get a nugget of it. And gentle banana flavour running through it all. Scrum. Eat with a cup of Earl Grey tea, in a china teacup of course. Banana choc nut cake anyone? Hilda Gerber’s chocolate sauce is amazing. It’s amazingly naughty and amazingly rich and for me an amazingly strong memory of Christmas and Hogmanay from my childhood. It’s also ridiculously easy to make. And once you can make Hilda Gerbers (the sauce is always just called Hilda Gerbers in our family) you can make the infamous Meringue Mountain, all gloriously seventies. Hilda Gerber was a cookery writer in the 30s and 40s in South Africa. But I knew none of this back when I was a child. A quick google and I discover that her manuscript for Traditional Cooking of the Cape Malays was found and published after her death in 1954. The Cape Malays were the descendents of slaves and political exiles, mostly from Indonesia and Bengal, who were brought to the Cape of Good Hope in the 17th and 18th century by the Dutch East India Company. Their name derives from the trader language they spoke, called Malayu. During the apartheid years any Cape Malay who converted from Islam to Christianity was reclassified as Cape Coloured. Their spices and condiments from the East, which arrived on the ships on their way back to Holland, pepped up the blander Dutch recipes in their colonial kitchens. I intend to seek out some Malay recipes – I think the only one I have is Bobotie from my Aunt Joyce. But surely I can get a Bredie recipe from my Aunt Astri? And I’ve wanted to make mebos (delicious nuggets of salty-sweet dried fruit) for AGES but I suspect Scotland does not have the climate for drying fruit. Anyway, allegedly Hilda Gerber used to ask local Malay women for recipes, so she could record them for posterity and compile a recipe book. Some of the Malay women silently sabotaged her efforts to create an indigenous cookbook, and would miss out a key ingredient, such as the milk in potato pudding, so any efforts to make it will end up with potato scrambled eggs. Hmmm, I’ll bet you’re not wanting to make this chocolate sauce now? In a bowl over a pan of water, melt the chocolate. Make sure the bowl is big enough to take everything, as all the other ingredients will be added to this later. Once melted, add the icing sugar. You’ll think it’s all gone badly wrong, when it turns into rubble, but trust me, it’s ok.
Add eggs and beat in, one by one. Keep warm, but do NOT boil. It’s looking a bit better now, huh? Leave it somewhere cool. Then eat. Or, instead of just eating it by the spoonful, make a Meringue Mountain. Make some meringues, the more the better. Big ones, little ones, medium ones. Crunchy ones and chewy ones. Just lots. And beat some cream, with a wee bit of sugar and vanilla if you want, but it’s not really necessary. Now make the mountain. Stick some meringues to the bottom of your dish with a dab of cream. Now squidge some cream on top of the meringues, so you can add another layer. And keep going with layers of meringue and cream until you have a mountain. Then pour the chocolate sauce over the top. You’ll need to have taken it out of the fridge a while before pouring, or it just won’t pour. Think about it, it’s mostly butter and chocolate which are quite solid in a fridge. You can do all manner of other things with it other than the Meringue Mountain, but remember it is incredibly rich – so you won’t need much of it. I suspect it would be good with a teeny tiny chocolate brownie and some vanilla icecream. Or have I just gone too far? Oh, and don’t even think of giving this to pregnant women. Or getting pregnant while you’re eating it. DANGER. I’m about to go make a batch to have on Christmas Eve. Nom nom nom. Thank you Nigella. They’re in the oven, so I don’t know yet if they are to die for, or a waste of some perfectly good ingredients. The constituent parts were scrummy (well, I had to lick the spoon after scraping the brownie batter into the tin, and the baconny-syrupy scraps on the plate were just asking to be licked up). But really? Bacon in chocolate brownies? I totally see where you came from with this – bacon and maple syrup pancakes are divine. And as a child I remember the treat that was bacon with fried bread and honey. Now, whatever happened to fried bread? Did the health Nazis get rid of it for good? Possibly not the worst decision ever made, but still divine in my childhood memory. Anyway, Nigella sent me a recipe for Bacon Brownies. Well, she didn’t just send it to me, it was sent out to anyone who subscribed to whatever style thingy she’s guest editing this week. And now I’m wondering if it was all just a big hoax, to see what muppets would actually make it. Well, here I am, prize muppet! I give you Bacon Maple Brownies, inspired by Nigella, but not exactly the same. (OK, now I see why my finished brownies seem even gooier than they should be, I had the oven not quite hot enough). Grease and line a 25cm square brownie tin. Or Nigella does it in a throw away tin, of course she does. Her hands aren’t made for washing up. And it’s so much easier to take a gift of brownies when you pop in to your neighbours if they are in a throw away dish! Once the butter is melted, remove from the heat and stir in the sugar with a wooden spoon. Bash out the sugary lumps (unless you anticipated this and sifted it in advance). While the butter was melting you should have put the flour, cocoa and bicarb into a bowl and mixed it. And cracked the eggs into a bowl and beaten them. Throw in the chopped chocolate, and then use your finger to nudge all the bacon off the plate into the chocolate batter. Lick your fingers. And wonder if this was all a hoax and you should have just made ordinary brownies, and had maple syrupy bacon bits as a separate snack. Pour the batter into the prepared tin and bake for 25 mins or so. It will still be slightly wobbly, so you have ultimate gooeyness in your brownies. But if you cook it at the right temperature it shouldn’t be too gooey. Leave to cool in the tin, then remove and cut into pieces. Not too small, but not too big pieces. You know, a couple of decent mouthfuls. 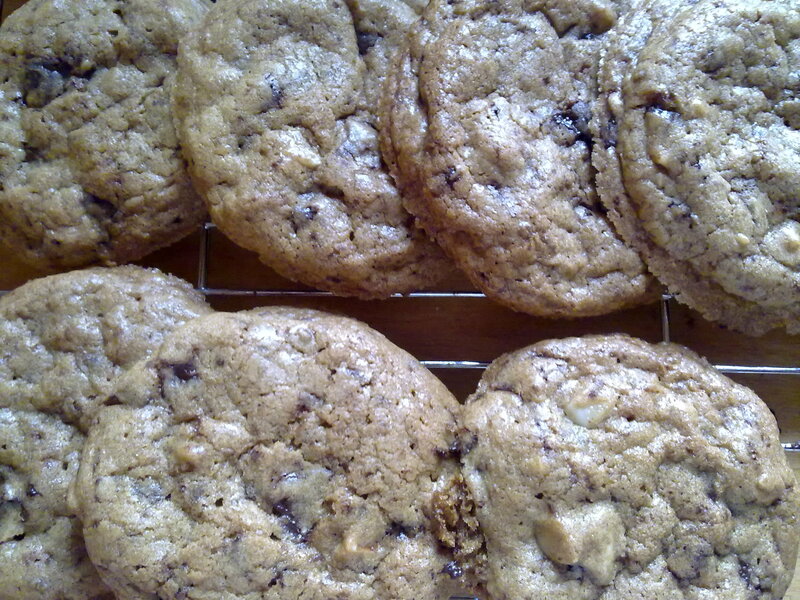 Mine are out of the oven now and I’ve decided it’s not a hoax – they are divine. That sweet yet salty hit of a wee nubbin of bacon is just perfect in the rich gooeyness of the brownie. They may not be glamorous, but oh my god they are tasty. So, this is a recipe I used to make years ago, when I was a teenager. The original recipe is from Rosemary Wadey’s Cakes and Cake Decorating which I think I bought with either school prize money, or a Christmas book token when I was about 14 years old. It has some of my favourite biscuit recipes: Grantham Gingers, Oat Crisps, Viennese Biscuits and the easiest of all: 1-2-3 biscuits. But perhaps my favourite was Melting Moments – they are easy to make, look as though you might have bought them and taste scrumptiously delicious. And they can be adapted. The basic recipe is for vanilla biscuits, rolled in scrunchy cornflakes before they are cooked, and with a nub of glace cherry on top. When I made them recently I realised we only had chocolate weetabix in the cupboard, no plain cornflakes. 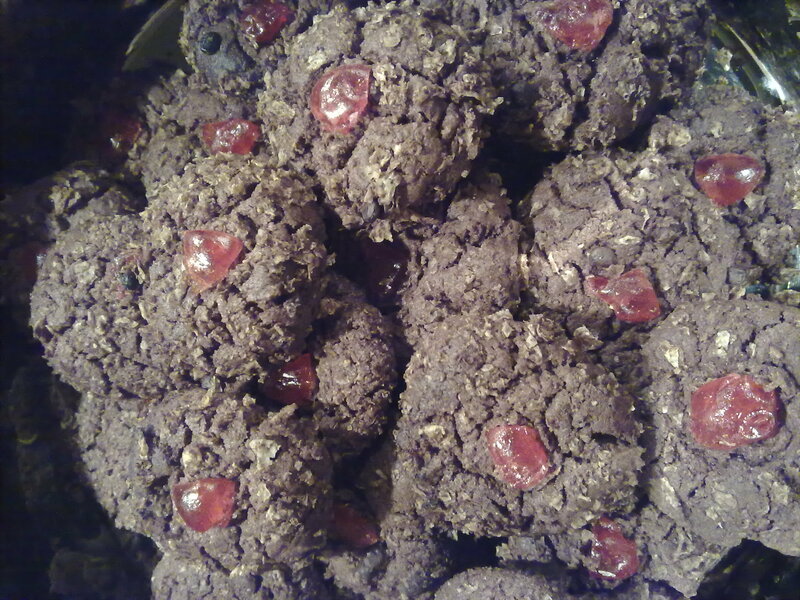 So, I made chocolate melting moments, rolled in scrunchy chocolate weetabix, still with a nub of glace cherry on top. Bake for 15 – 20 mins or till golden brown. Replace 1-2 oz of flour with 1-2oz of cocoa powder and about 1/2 tsp baking powder. You can also replace some of the flour with custard powder to give a smoother and creamier biscuit. Again, just swap some of the flour for custard powder, and add a wee bit of baking powder. I think they would be nice with a wee bit of chopped ginger (you know, the stuff out of the jar) in them. But then I love gingery things. You would probably want to replace the glace cherry with a nubbin of ginger too. Yum.